A New and Accurate Map of the Kingdoms of Naples and Sicily. 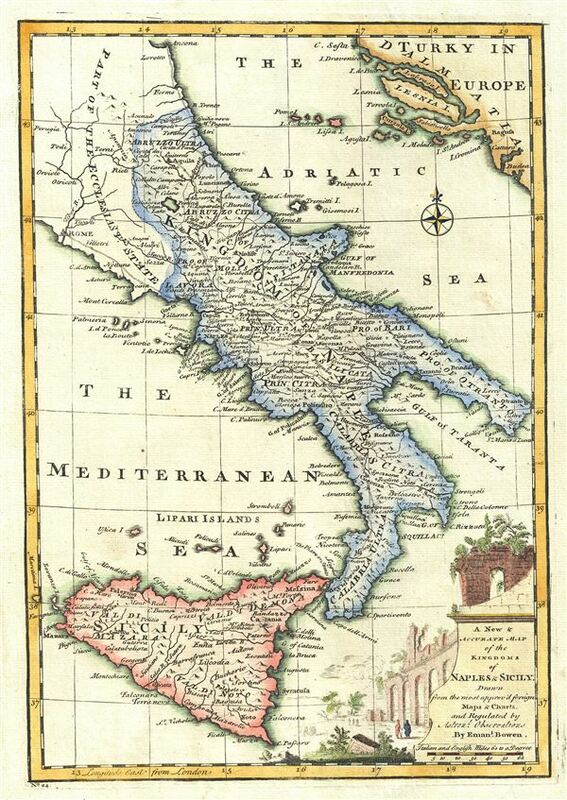 An attractive 1747 map of southern Italy by the British cartographer Emanuel Bowen. The map covers the Kingdoms of Naples and Sicily in great detail, including part of the Papal States, noting important towns, cities, roads, rivers and topography, with mountains rendered pictorially. The lower right quadrant features a beautifully illustrated title cartouche. This map was prepares by Emanuel Bowen as plate no. 20 for the 1747 issue of A Complete System of Geography. Rumsey 3733.023. Philips (atlases) 614 (1752 edition).